Clone Wars keeps getting better as it goes along. I can tell they're getting better at telling compelling stories. This is the first season where there aren't huge sets of bad episodes. There are still some lame storylines that don't really lead anywhere, like the droids random adventures or Obi-Wan going undercover to bust a crime syndicate's plan. But, for the first time, the majority of the season was good. The season opens with a multi-episode storyline about underwater war on Mon Calamari that has cool battles and unique underwater stuff. The storyline could have been faster but it was decent. There's a mid-season storyline dealing with the clones that's amazing. It's easily in the best storylines of the whole series so far. It's about what happens when a general treats clones more like droids than like men. The second half of the season has a compelling storyline about Anakin (and crew) dealing with slavers that makes him come to terms with some of his past. It actually develops his character further which is something I always like to see. And then the season wraps up with Asajj Ventress, the night sisters, and the return of Darth Maul. 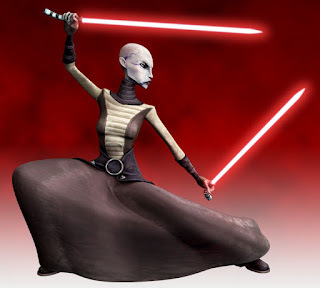 After that, I'm really interested to see what they do with Ventress in the final seasons. This is the first season where I can recommend most of the episodes as good, and that's a great change from the past seasons. Now there's only one "true" season left in Season 5. Season 6 is the bonus episodes that were completed but never actually aired on TV. Now that I'm on a roll I might try to wrap these up quick and move on to a new show.